By Ron J. Steingard, M.D. Why they are more vulnerable than boys, and what signs and symptoms you should look for. Anxiety and depression occur in both genders, but by the teenage years, girls are much more at risk than boys. Before puberty, the prevalence of mood disorders is about the same in boys and girls—3 to 5 percent. But by mid-adolescence girls are more than twice as likely to be diagnosed with a mood disorder as boys, with the prevalence at adult levels, 14 to 20 percent. Why such a big disparity in mood disorders? We know from looking at brain scans that there are differences in the way girls and boys process emotional stimuli. Girls mature, in terms of their emotional recognition, faster than boys—and that sensitivity could make them more vulnerable to depression and anxiety. It's plausible that that these gender differences around the time of puberty can be traced to evolutionary advantages: Girls may be wired to tune in earlier to emotional stimuli because it was advantageous for nurturing babies; for young men, given their roles as hunters and tribe protectors, emotional responsiveness might have been an important attribute not to have. The argument that the differences in emotional sensitivity are hard-wired is underscored by the fact that even as women's lives have clearly changed—with many more women living professional, competitive, Type-A lives—the rate of depression hasn't dropped. Even the participation of far more girls in sports and other intense physical activities hasn't reduced the rate of depression, though physical activity is important to emotional well-being, and one effective way to help jumpstart recovery in someone who's depressed. In adolescent depression, the thing people tend to notice first is withdrawal, or when the teenager stops doing things she usually likes to do. There might be other changes in her mood, including sadness or irritability. Or in her behavior, including, appetite, energy level, sleep patterns and academic performance. If several of these symptoms are present, be vigilant about the possibility of depression. This is especially important because by the time family members and other people around a teenager note her lack of interest in most things, or what we call anhedonia, she's usually been depressed for some time. Depression is an internalizing disorder, i.e. one that disturbs a patient's emotional life, rather than an externalizing one, which manifests in the form of disruptive or problematic behavior. As such, it takes a while not only for others to recognize it, but often for the patient herself to realize that her thinking, and emotional responses, are disturbed. Note that there are actually two kinds of depression. In major depressive disorder—the most familiar form of depression—the cluster of symptoms that define depression occur in what may be severe episodes that tend to last from seven to nine months. But there is also another form of depression called dysthymic disorder, in which the symptoms are milder, but they last longer, measured in years. So, while the experience of dysthymia may be less debilitating for the child at any given moment, the risk is that there is more accrued damage, more time in which the child is kept out of the healthy development process. Anxiety is a normal adaptive system that lets the body know when it's in danger. But anxiety becomes a problem when it's out of proportion to the situation, and interferes with a person's ability to function. An overly anxious teen might withdraw from activities because she's too scared or anxious, and her anxiety doesn't go away with reassurance. A teenager who has been anxious since childhood may have a lifestyle built around her anxieties: the activities and environments she chooses and those she rules out, the friends she is comfortable with, the expectations and limitations she has trained her family, friends, and teachers to accept. That's why it's more challenging to treat anxiety the longer a child has lived with it, and developed unhealthy coping mechanisms to manage it. When a child is depressed or anxious, her suffering isn't the only reason it's important to get help. In addition to the disorders themselves, there are add-on effects that may cause lifelong issues. With depression comes low energy and poor concentration, two factors that are likely to have a significant impact on social and academic functioning. Anxiety, and the withdrawal that may accompany it, is likewise a detriment to social and academic progress. It's easy to see the effects of poor academic functioning: falling behind in school undermines a child's confidence and self-image, and can impact her future if it's prolonged. But social learning is just as critical as academic learning in childhood and adolescence. This is a time when a girl would normally be learning such things as how to be a daughter, a sister, a friend; with either depression or anxiety, she may miss or fall behind on these critical kinds of learning. These deficits not only put her behind her peers, but in themselves they can compound her depression or anxiety. It's important to understand that anxiety and depression often occur in the same teenager, and may need to be treated as two separate disorders. Anxiety is more likely to occur without depression than depression without anxiety. It may be that depression leads to anxiety—the negative state of mind of a depressed teenager lends itself to uncertainty. If you're not feeling good about yourself, or confident, or secure, or safe, anxiety may find fertile ground. It may also be because the regions of the brain affected by anxiety and depression are close together, and mutually affected. Two serious problems that are directly associated with teenage depression and anxiety are suicidal thinking (or behavior), and substance abuse. Suicide is the third leading cause of death among adolescents and young adults aged 15 to 24, and we know that most kids who commit suicide have been suffering from a psychiatric illness. Especially at risk are teenagers who hide their depression and anxiety from parents and friends. 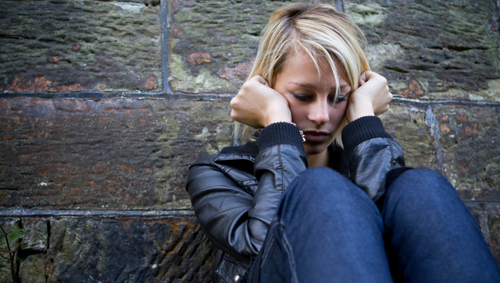 That's why it's important to be alert to signs of these disorders—withdrawal, changes in school performance, eating habits, sleeping patterns, things she enjoys doing—even when teenagers aren't forthcoming about how they feel. Similarly, the majority of teenagers who develop substance abuse problems also have a psychiatric disorder, including, most commonly, anxiety or depression, which is another important reason to get treatment in a timely way. Two other problems associated with teenage girls—that is, occurring with greater frequency in girls than boys—are eating disorders and self injury, or cutting. While both of these can overlap with depression, the common assumption that they're caused by depression is not borne out by research. Girls who have eating disorders often show no signs of depression; indeed, they are often very high-functioning, competitive girls who have a distorted body image, but not the symptoms of depression. Similarly, self-injurious behavior is a kind of dysfunctional coping mechanism kids get into to alleviate emotional pain, or numbness they've developed as a result of that pain. It can occur with, and be complicated by, a mood disorder, but isn't thought to be a result of the latter. Antidepressants, the medication of choice for mood disorders, don't usually alleviate eating disorders or cutting, which receive different kinds of treatment. Fortunately, early involvement of health care professionals can shorten the period of illness and increase the likelihood of her not missing important life lessons. The most common treatment a mental health professional is apt to use is some form of cognitive behavioral therapy, and depending on how young the child is, it may involve teaching the parents as well. Cognitive behavioral therapy is based on the idea that a person suffering from a mood disorder is trapped in a negative pattern of thought. Depressed kids tend to evaluate themselves negatively, interpret the actions of others in a negative way, and assume the darkest possible outcome of events. Similarly, a child suffering from anxiety is overwhelmed by fears of negative outcomes long before events occur. In CBT, we teach sufferers to challenge those negative thoughts, to recognize the pattern and train themselves to think outside it. And in many cases we see real improvement in teenagers with depression and anxiety. If the anxiety or depression is moderate to severe, treatment may involve medications such as antidepressants. For both anxiety and depression, a combination of psychotherapy and medication usually works better than either alone.